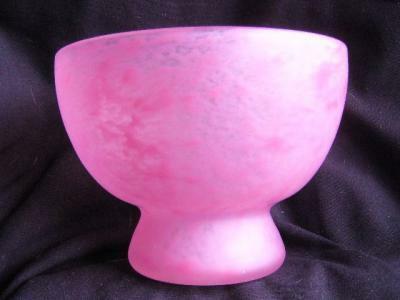 This is a wonderful matte finish Steuben Cintra bowl in pink measuring 6 1/2 X 8 1/2 inches. It is in mint condition. The matte finish is attractive and adds to its special look. I personally haven't seen this piece before and think it may be quite rare. It has the acid stamp on the bottom.